While learning English language continues to be one of the most sought after practices in Bangladesh, English in Action, a BBC World Service Trust project, takes it a notch higher with the ambition to raise the English language skills of 25 million Bangladeshis by 2017. Using the most widely adopted and affordable media available -- the television -- to reach out to the many millions of ordinary people, the project, in a unique effort, brings together a supernatural detective drama Bishaash, accompanied by a game show, BBC Janala: Mojay Mojay Shekha, to take learning right into living rooms. The lively hosts during an interactive moment of Mojay Mojay Shekha. The series follows the story of Zara, a young British-Bangladeshi who moves to Bangladesh after discovering that she is the co-owner of an antique shop in Dhaka. Packed with an absorbing storyline and special effects, and with most of the speech in Bangla to attract a mainstream audience, it also includes functional English lines. The series is followed by BBC Janala: Mojay Mojay Shekha, an entertaining educational game show and comedy which expands on the English used in the drama. Broadcast back-to-back on BTV and BTV World, the programmes provide its 14 million viewers with a fun and accessible way for families to learn English together. Dubbed as “entertainment with a social conscience”, the programmes bring forth a sense of competition not only among the contestants who take part in the game show, but also among its viewers who are driven to take something out of both the shows. “Dramas rarely help you in practical life, but the lessons that I get from Bishaash and Mojay Mojay Shekha are such that I can use them everyday,” comments Redwan, a high school student. “I get two things from Bishaash, entertainment and educational materials. One does not find such a combination everyday in a drama,” says Raihan, a student from Faridpur. Although, by no means an alternative to classroom learning, the initiatives are undoubtedly bringing marked differences in the general attitude towards learning and speaking snippets of coherent and functional English. Capitalising on the fun factor, the producers and the rest of the crew have been successful in attracting children, adults and families in opening up a world of supernatural drama, colourful games and more importantly, love for words. Missing an episode does not make a viewer feel like he has missed out on his verbs or tenses. 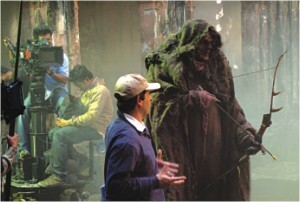 On the sets of Bishaash. Fun and madness continues with the partner programme, Mojay Mojay Shekha, which involves all kinds of games and puzzles participated by contestants of all ages. The show, hosted by Rumana Malik Munmun, is a burst of colours and innovative games that immediately attract the younger audience. Giant alphabets, racing rickshaws and cricket games are only a few of the exciting things lying in store. Reaching out to people across all ages and backgrounds, these attention-grabbing TV treats are bringing in ripples of change in the way a language is learnt and understood. Next time, a rickshawallah responds to you in English, don't be surprised; it is Bishaash and BBC Janala spreading its magic through the streets of Bangladesh! Catch the show on BTV every Friday at 6:30 pm with repeat telecasts on Saturdays at 2:15 pm and Tuesdays at 3 pm.